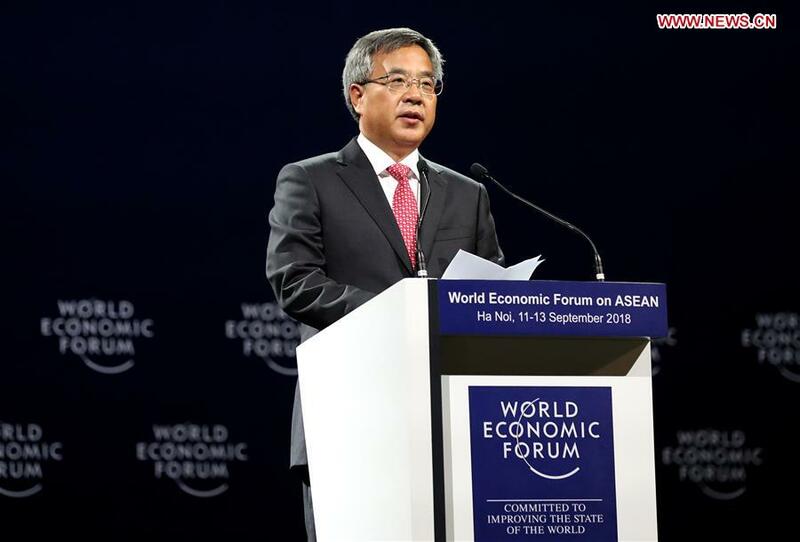 HANOI, Sept. 12 (Xinhua) -- China stands ready to work with the Association of Southeast Asian Nations (ASEAN) and other countries across the world to help develop an innovative, open, interconnected and inclusive global economy, Chinese Vice Premier Hu Chunhua said on Wednesday. Hu made the remarks here at the opening ceremony of the World Economic Forum (WEF) on ASEAN 2018 themed "ASEAN 4.0: Entrepreneurship and the Fourth Industrial Revolution." Now the world economy is picking up, but uncertainties and destabilizing factors are on the rise, posing challenges to economic globalization and multilateral trading regime, Hu said. In such a complex environment, he said, China stands ready to work with ASEAN and other countries across the world to seize the opportunity of the new industrial revolution, uphold opening up and win-win outcomes, promote innovation-driven development, pursue inclusive growth and interconnected development, so as to help develop an innovative, open, interconnected and inclusive global economy. Hu stressed that ASEAN is China's good neighbor, and a good partner for Belt and Road cooperation; China is willing to work with ASEAN countries to boost development programs synergy, expand economic and trade ties, deepen cooperation in innovation and advance regional economic integration, so as to build an even closer China-ASEAN community with a shared future. He pointed out that China's economy has maintained steady and sound growth in recent years and this year marks the 40th anniversary of China's reform and opening-up. The Chinese vice premier said that China's resolve to open its doors still wider will not change, even when the external situation changes, adding that China will consistently pursue opening-up at its own pace. Foreign enterprises are welcome to work with Chinese businesses to seize opportunities, tap potentials, and broaden and deepen cooperation for win-win outcomes, Hu added.